USAA purchases Bank of America Plaza. 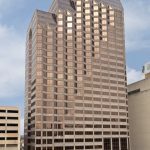 The deal closed on Monday; while the sales price was not disclosed, the building was last appraised by Bexar County for $88 million. The 28-story tower at 300 Convent St. was last owned by two real estate investment companies: Talcott Realty Investors of Hartford, Connecticut, and Clarion Partners of New York. The Bank of America Plaza, which opened in 1984, houses more than 530,000 square feet of office space, making it the largest office building downtown. And at 387 feet high, it is the fifth-tallest building in San Antonio. USAA’s purchase included the entire 1.83 acre plaza. USAA is interested in renovating and updating the building but as of right now, there are no specific plans in place.